We’ve come a long way since the days of relying on snail mail, typewriters, and fax machines (remember those?) within the world of work. With the advent of AI, robotics, smartphones, and supercomputers, the tools we now use for work have compelled organisations to adjust their structures and business models. While technology is generally considered a positive influence in the workplace that increases productivity and makes work easier, there’s also an increasingly loud argument that caution should be exercised as technology becomes ever more sophisticated and influential. 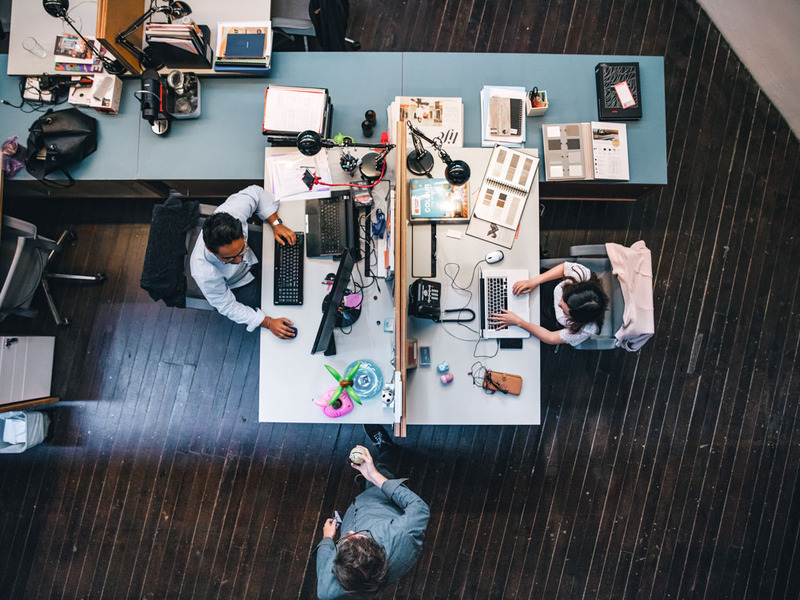 As millennials continue to enter the workplace, older generations start retiring, and tech continues to change the professional landscape, what does it mean for organisations and the people within them? We take a look at the pros and cons of technology in the workplace and what that means for the future of work. While the list of pros is seemingly endless, the crux of it is that technology enables us to do more work, in less time. Day to day tasks and processes can be streamlined or automated, apps like Slack and Trello keep us organised and more efficient, digital storage reduces clutter, and Google Docs allow us to work on documents or projects simultaneously with colleagues without having to triplicate resources. But perhaps the greatest perk of technology is freedom. Thanks to tablets, laptops, and smartphones, it’s now possible, in theory, to work from anywhere at anytime. It’s predicted that by 2020, 50% of us will be working remotely. And thanks to Tim Ferriss and his eponymous book championing a 4-hour work week, becoming a digital nomad is an increasingly popular career path. Because who wouldn’t want to travel the world funded by profitable passive income streams? Without tech, none of this would be possible. It all sounds great, doesn’t it? But as always, there’s a catch. While the freedom technology affords us is appealing it also means we’re permanently contactable, blurring the boundaries between personal life and work. Our mental health is suffering as the ability to ‘switch off’ becomes increasingly difficult. Especially as the majority now work in a global environment that doesn’t observe business hours. In France, laws have been introduced to prevent organisations with over 50 employees sending work emails after 6pm in a bid to prevent burnout. But what about the rest of the globalised world? Equally, while messaging apps and email enable us communicate more efficiently, it can also create barriers within organisations. It’s all too easy to revert to email and lose face time with colleagues. This lack of direct contact creates a silo mentality that slowly erodes any sense of team and reintroduces inefficiencies into the workplace. A recent LinkedIn poll found 46% of work professionals worldwide believe that work friends are important to their overall happiness. What happens to our enjoyment of the work we do if we remove personal contact from the equation? As technology gets smarter, the challenges around security also increase exponentially. The recent Facebook and Cambridge Analytica scandal only serves to highlight the dark side of tech. Maintaining control over subversive uses of tech and cyber hacking is a very real issue that could prove to be the downfall of many. Equally, as security becomes tighter, will this invade the privacy rights of employees whose every move within an office can be monitored by surveillance equipment, key card activity, and phone or internet use?